Manuel Legris entered the Йcole de Danse de l'Opéra de Paris in 1976. At 16, he was engaged in the corps de ballet. In 1984 he won the Gold medal at the International Competition in Osaka with Elisabeth Maurin, and in 1985 he received the Prix Carpeaux. Manuel Legris was promoted to Etoile by Rudolph Nureyev on the stage of Metropolitan Opera in New York after his performance of Raymonda where he danced the part of Jean de Brienne. In 1988, he received the Prix Nijinski. As well as his intrinsic abilities: a faultless technique, expressive wealth, Manuel Legris asserted himself as an exceptional partner, a comprehensive dancer switching with astonishing easiness between classic and modern repertoires. Thus, from Forsythe to Neumeier, from Kylian to Robbins, the most well-renowned choreographers have not ceased to seek him out: Manuel participated in the majority of new creations for or by the Opйra de Paris. 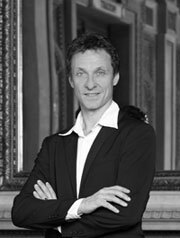 At the same time, the reputation of the star dancer very quickly crossed borders: Manuel Legris was invited by the most prestigious companies like the Royal Ballet of London, the New York City Ballet, the National Ballet of Cuba, the Tokyo Ballet, the ballets of Monte-Carlo, Stuttgart and Hamburg, where John Neumeier created Spring and Fall and A Cinderella Story especially for him. A prestigious guest, Manuel Legris appeared on all the great stages of the world from La Scala of Milan to the MET of New York, while passing through Moscow's Bolshoi, where he saw himself awarded the Benois Prize for his remarkable performance in Roland Petit's l'Arlйsienne. More recently, he performed in several revivals in the Mariinsky Theatre in Saint Petersburg. In other respects, Manuel Legris travelled the world with his troupe: Manuel Legris and his Stars. This idea was born in 1996 from the common with of Manuel Legris and Monique Loudiиres, who thus hoped to allow young dancers to tackle the roles of soloists still inaccessible to them at the Opйra, to allow them to work with the most famous choreographers. Regularly invited to Japan, this troupe performed in prestigious surroundings like the amphitheatres of Nоmes, Frйjus, Bayonne, Arles or the Olympic theatre of Vicenza, Italy. In December of the same year, Manuel received the Nijinski Award, which named him the best dancer in the world in the year 2000. In September 2001, he received the Prix Lйonide Massine in Positano, Italy. Finally, he came to see himself awarded the Prix Danza & Danza, marking him out as the best dancer in the year 2002, for his interpretation of Frollo, in Roland Petit's Notre-Dame de Paris. In 2003, Manuel Legris added two major productions to his repertoire: Roland Petit's Variations sur Carmen, and Maurice Bйjart's Phrases de Quatuor. In the same year, Maurice Bйjart restaged Le Chant du Compagnon Errant for him and Laurent Hilaire and gave them freedom of expression/representation In 2004, he did another triumphant tour of Japan with his troupe, to which he added Monique Loudiиres and Laurent Hilaire as special guests. In December 2004, he will perform in a new production by Trisha Brown alongside Aurйlie Dupont and Nicolas Le Riche. 1993: Chevalier des Arts et Lettres. 1998: Officier des Arts et Lettres. 2002: Chevalier dans l'Ordre National du Mйrite.